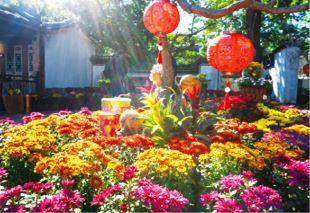 Spring Festival is around the corner, and the Lin Family Mansion and Garden will host a chrysanthemum festival in its Xian-yu Yi parterre. The Lins used to celebrate the arrival of Spring Festival with chrysanthemum-viewing and poetry recital, which would see the commencement of another year full of good fortune. The program also includes lion dance, concerts of traditional music, pops and folklore, “Turning the Wheel of Fortune” gashapon, stamp collection and lucky-draws. The management will also present a number of exciting performances and traditional handicraft DIY workshops each day. These DIY workshops and activities include those of paper umbrella and lantern. Come celebrate a joyful Spring Festival with us! CAR→Take Heping West Rd. Sec. 3 in Taipei, over Huajiang Bridge and proceed along Wenhua Rd., turn right on Minquan Rd., then make a left turn. The Garden is next to the Banqiao Second Stodium. BUS→Take bus number 264,307,310,701,702 and alight at Lin Family Mansion and Garden stop to reach Banqiao’s Lin Family Mansion and Garden. MRT→Take Banqiao Line (Blue line) to Fuzhong MRT Station, and leave by Exit 1. The Garden is an 8-minute walk from the station.